As I mentioned in an earlier post, when I announced to my beer0loving friends that I was spending a summer in Berlin, most lamented that I was visiting Germany's least interesting beer-city. I made posts on both BeerAdvocate and RateBeer looking for suggestions of breweries or bars, and though I got a couple of helpful suggestions that got me started on the right foot, most commentators echoed the sentiments of my other friends: good luck finding any good beer. At The Festival, I spoke to two different German brewers who repeated the now common refrain: there is no good beer in Berlin. But I am stubborn. I simply couldn't believe that a city as significant as Berlin would be such a lame duck in terms of beer. Berlin has everthing, why wouldn't it also have great beer? Thankfully, my stubbornness won out, and I discovered that there is a Berlin craft beer scene. Though it is small and in its infancy, there is a growing population of local beer enthusiast that are convinced that there is more to beer than watered down macro-brew. They are excited, passionate, and can talk beer for hours. And most of them seemed pretty willing to chat with an American who was just as passionate as they! This is quite an underground scene and a tad difficult for an outsider to discover: ask 100 random Berliners, and chances are pretty high none of them will know of any craft beer in Berlin. (Or for that matter, chances are high they won't even know what craft beer is!) Hell, even my American beer0crazed friends knew nothing of it. Yet after spending two months in Berlin, I came away with the opinion that there is at least one brewery, one bar, and one store that are of a high enough caliber to sugest a slightly different future for Berlin: a future where craft beer isn't such an esoteric oddity, but rather something served (and drunk!) at every bar and restaurant in the city. OK, I exaggerate: that's probably not going to happen in our lifetime. But, maybe in five or ten years, at least two out of a hundred Berliners would know just what craft beer is. Though Berlin boasts a little over twenty breweries, very few of them branch beyond traditional German beer styles. By now, I have mentioned Brewbaker beers in several previous blog posts, mainly in regards to their IPA and their Weisse. They brew several different beers, and in addition to the obligatory Pilsener (unfortunately the only Brewbaker beer I was unable to try), they also brew several other American, English, and German styles, all of which were at the very least well done, and at the best, pretty specatular. With the slogan "Nicht für Weicheier!" 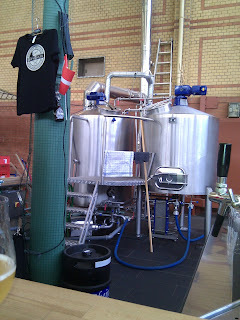 (Not for wimps), there's no doubt this is Berlin's most unique brewer... by far. The brewery is well outside the tourist parts of town, nestled in the back of the Arminius Marthalle: an indoor market full of butchers, fish, and fruit stands. The brewery's "bar" (they supply the quotes) is a single L-shaped bar with three stools and a few tables. There's a chalkboard listing the beer available and also a small refrigerator holding bottles for sale. Sadly on the ay I visiting the brewery, the brewer himself was ill. In his place was a surly young bartender who didn't' care much for either the beer he was pouring or conversation of any kind. Brewery tours and Beer Seminars are sporadically available, but none ever aligned themselves with my schedule and was thus never able to attend. Just around the corner from the Markthalle is Zunftwirtschaft: a quaint little German restaurant that serves many of Brewbaker's beers. The wait staff is quite friendly and knowledgable, and the night I was there featured an outdoor grill with fresh sausages and chicken. The chef boasted that all of his ingredients are local, seasonal, and fresh, and it certainly tasted that way. This restaurant is well worth visiting, and actually provides a better opportunity to sample Brewbaker beer than the brewery itself. The most surprising aspect to Brewbaker was how little one actually finds their beer in Berlin. In fact, it would be tremendously easy for one to spend several months in Berlin and never learn of its existence. The website lists only fifteen restaurants that sever the beer, and at least one of those (Cafe Einstein) certainly didn't have any available when I was there. 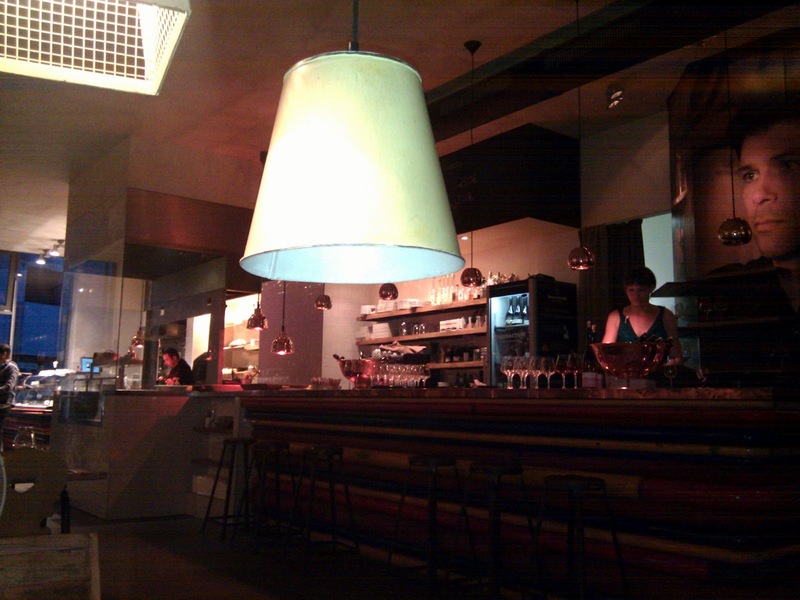 (Keep in mind: Berlin is home to thousands of restaurants.) Buying bottles to take home isn't necessarily easier: besides the brewery itself, only nine stores sell the beer, one of which appears to be purely online sales. This would be unheard of in most cities in the US, where the local microbreweries are proudly poured in dozens of different restaurants around town. Of course, the easiest explanation is that the beer is "too sophisticated" or "too bitter" for the average Berliner. And while it may be true that the average Berliner has no interest in their Elder Blossom Ale or their Double IPA, I find it hard to believe that the same average Berliner wouldn't enjoy Brewbaker's Pilsener or Weisse. 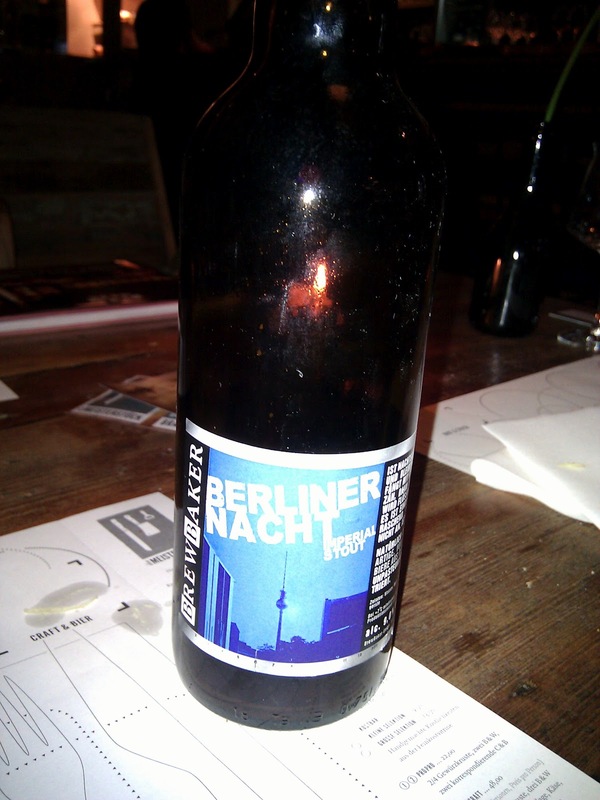 Of the several beers I tried, my favorite is likely the Berliner Nacht. A dark Russian Imperial Stout of 9% abv, it is tremendously complex with notes of licorice, caramel, coffee grounds, bitter chocolate, and roasted malts. A great accompaniment with a square of bittersweet chocolate, this makes an excellent after-dinner beer. Beer is easy to find in Berlin. Like just about every German twon, it is as ubiquitous as water. Thirsty? Walk no more than a block in any direction and you are bound to a find a local watering hole. But for those who are interested in more than Berliner Kindl or Schöfferhofer, there are very, very few options available. 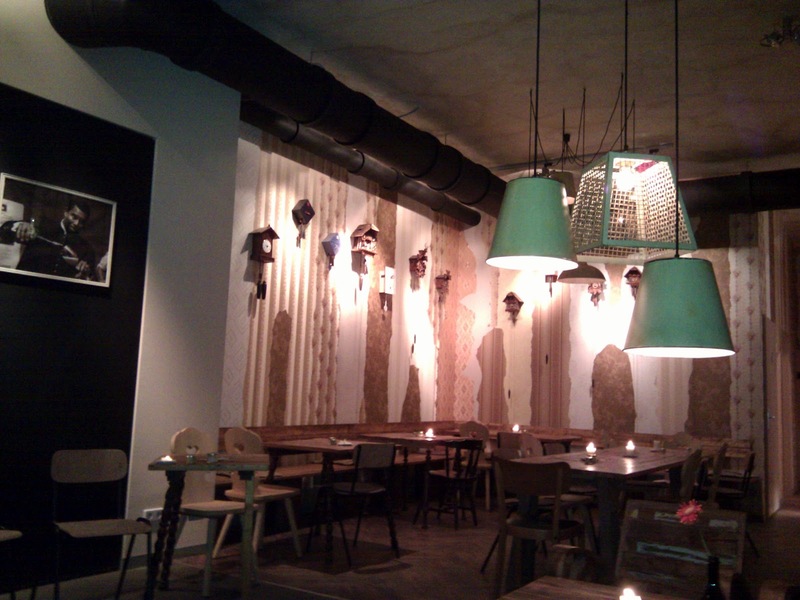 Enter Das Maisterstück: Berlin's only craft beer bar. Situated only 500 meters outside of Schloßplatz and right next to the Hausvogeiplatz U-Bah, Das Maisterstück is a haven for any beer enthusiast. A relatively new establishment – they opened only five or six months ago – the restaurant/bar features high-end German cuisine in a low lit, homey, environment. When walking in, I was immediately greeted by a large open gril featuring an array of gourment sausages. With the grill lending a slight smoky haze to the room, there was a certain rustic quality to the entire place: it was immediately inviting, and I was immediately excited. 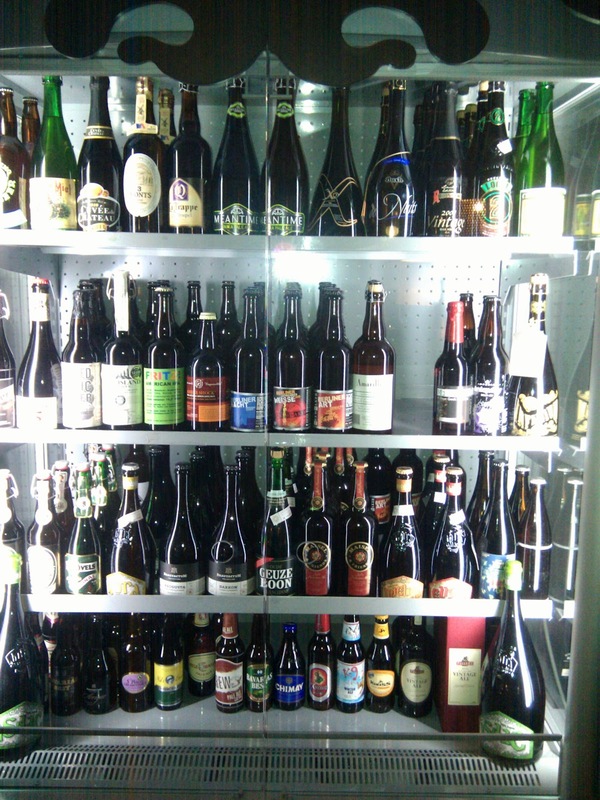 The restuarant has two beer refrigerators, the first featuring exlusively BrafactuM beers, the other shelving various German and international craft beers. On the walls are dozens of cukkoo clocks as well as pictures of Mark Rauschmann (head brewer of BraufactuM) and Garrett Oliver (head brewer of Brooklyn Brewery). 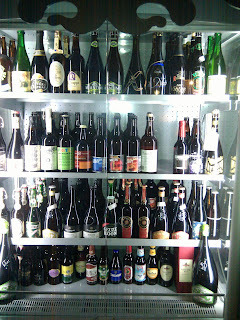 While looking at the beer collection, I saw many beers with which I was unfamiliar, and a lovely server immediately came over and went through a thorough explanaion of every beer in the case. This was woman who knew her beer! We were treated extremely well by our various servers, particularly Chris Shock. Chris was relatively new to craft beer and was anxious to try new styles and new varieties. And he was more than happy to sit and talk beer; in fact, the first night I visited, he probably spent just as much time sitting at our table as he spent working in the restaurant! Not that I minded in the slightest, of course; he was fantastic company, and his excitement over beer was palatable. He was also extremely generous, pouring us a couple different beers on the house. When a beer is ordered, the waiter brought over high-stemmed glasses for everyone at the table. The glasses, which are designed by BraufactuM, are beautiful and cover the nose perfectly as you sip, allowing just the right combination of flavor and aroma. A small amount of beer was then poured into the glass – the glass is never more than 1/4 full – and, depending upon the style, the bottle was then put into an ice bucket. Is this a bad thing? With the exception of the prices, certainly not. The stemware is beautifully designed, my beer is served at the right temperature, and I'm having a great time and feeling like royalty. But it does strike me as unique, and a little unusual, that they would market their beer to such audiences. Perhaps because the average German has so little interest in anything other than macro-Pils, the craft beer scene determined that the gourmand, foodie, and wine connoisseur were the best target markets. Granted, if there's ever going to a possibility of sipping a great craft beer while watching a football game at a local pub, the German craft market will eventually have to target a different clientele. Admittedly I haven't been to many German craft beer bars, and the extreme majority of German craft beers I try are bought at the store and taken home. Maybe the reader has had different experiences in German craft bars, and if so, I would genuinely like to hear your opinion (and for that matter, I would like to learn where these places are, in Berlin or otherwise). And I should also mention that having a gourmet-food/craft beer bar is in no way in-and-of-itself odd; it is rather the fact that this beer is only available at high-end locations that strikes me as curious. In any event – whether this is the norm or the aberration – I sincerely hope restaurants like Das Maisterstück survive. The two times I visted the restaurant, there were many seats available, and though the place was never empty, it also was certainly not bustling. One this is certain: regardless of to whom they are marketing, bars like Das Maisterstück have a pretty fierce uphill battle to wage in order to flourish in Germany. But if the United States can be transformed from the land of piss-beer to one of the greatest beer countries in the world, it's not impossible for the German market to grow and allow bars like this to flourish. With boxes and mislabeled cases piled everywhere, one really doesn't know what to expect when first walking into the Berlin Bier Shop. On this particular visit, I was looking for German IPAs. The previous day, I had visited the store's blog online and saw that an IPA tasting had taken place roughly a week early. I assumed, then, that if I were to find a collection of German IPAs in Berlin, this was my most likely bet. As I walked in, I started aimlessly wandering around. 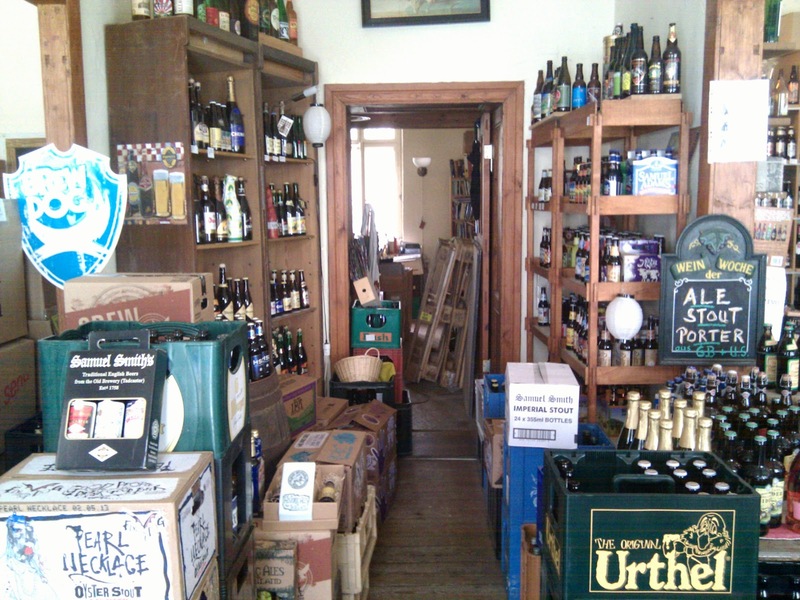 There was little discernible organization to the store: I found a bookshelf dedicated to (mostly) Belgian beers, a couple of shelves in the adjoining room (which is predominantly wine) dedicated to (mostly) English beer, and then a whole lot of chaos. But I only had to wander with visible puzzlement for a couple of minutes before store owner Rainer Wallisser came out of the back office (which at a glance looked equally as disheveled) and quickly came to my aid. Though the Berlin Bier Shop doesn't have an enormous selection, there is no lack of quality beers. It was obvious within seconds of our conversation that Rainer knew his beer, and that he had designed this store to be a place Berliners could visit to become better acquainted with the great beers of the world – and the great beer within their own country. As we talked, I began to let my eyes wander around the store. He had quite a collection of both full and empty bottles of high quality American micro brews including Russian River's Pliny the Elder (NOT for sale: I asked), as well as selections from Hair of the Dog, Avery, and others. 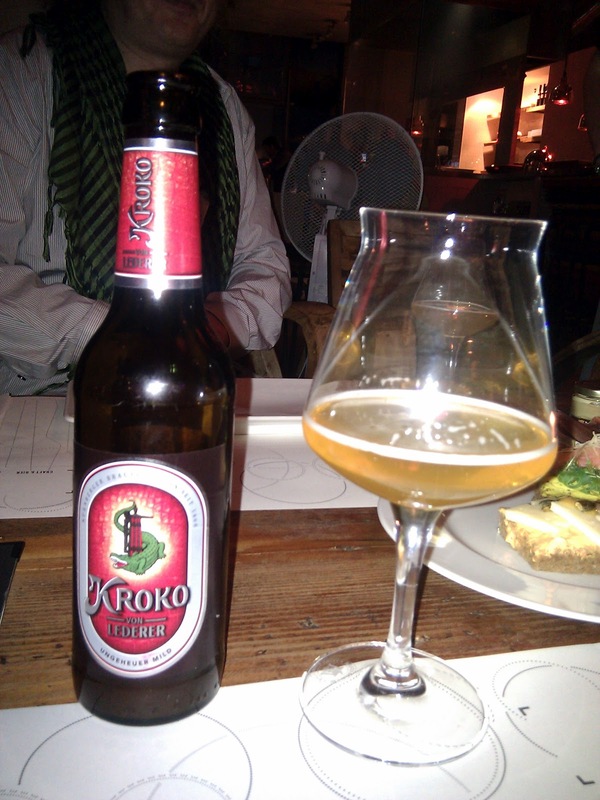 He also proudly showed me his rare Russian nano-brewed beer that was brewed without water (using pine sap instead). We talked for probably thirty minutes, during which he introduced me to Brau Kunst Keller – an experimental brewery out of Odenwald that produces beer in 50 liter batches. 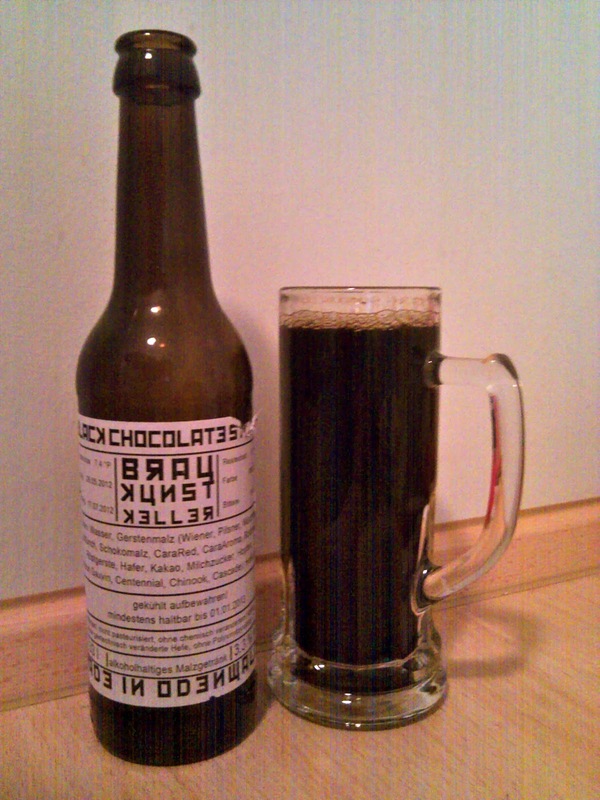 He encouraged me to take home Brau Kunst Keller's Black Chocolate Stout, and I'm glad he did: the beer was probably the biggest surprise on my entire trip. Despite clocking in at a very drinkable 3.3% abv, it had an excellent silken mouthfeel without a hint of wateriness. The brewer used bittersweet chocolate syrup, which lent a lovely chocolaty aroma, but actually factored very little in the taste. There was a tremendous balance between the bitter flavors (from both the chocolate and the hops) and the roasted malts. It really was an excellent beer The brewer (who is the head brewer at Michelstadt) is hoping to create enough excitement for his beer to enable him to expand into a full-sized brewery. With beer like the Black Chocolate Stout, there is no doubt he has the chops for it. I only he finds enough people willing to give it a try! I ended up buying several bottles of various IPAs and just about every Brau Kunst beer there. The prices seemed pretty reasonable: the Brau Kunst beers were on average €4 or €5 each which seemed plenty reasonable considering the low production. It occurred to me when I left, however, how the store had two unusual omissions: Brewbaker and BraufactuM were no where to be seen. Of course, I should add that just because I didn't see them doesn't mean they weren't there; the store was pretty hard to navigate. But all the same, the omission (or lack of visibility) was curious. Overall, if you are in Berlin for an extended period of time, the Berlin Bier Shop is a must visit. It's well worth the time. 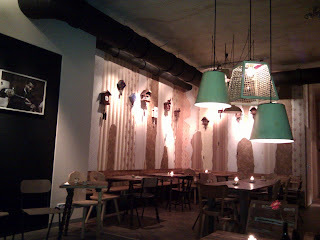 So what are your favorite Berlin beer establishments? Feel free to share them below! And while you're at it, consider following me on Twitter. I do short reviews on various beers and share other beer-related info. It's also a great way to stay informed on upcoming Churchyard tasting events! Great post on some biers & shops we didn't know about - thanks! 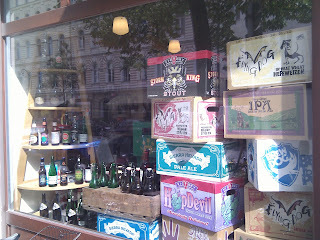 We were surprised upon arriving in Berlin from Seattle how hard it was to find a variety of beer. As far as breweries - I would also recommend Hops & Barley in Friedrichshain, Eschenbräu in Wedding, Privatbrauerei Am Rollberg in Neukoelln, & neighborhood beer Quartiermeister. Go try the Mier at Meta Mate... a mate bar that has an IPA made with mate.